In 1972 Hurricane Agnes flooded our small black Baltimore suburban community. Dad and my brother rescued residents from the roofs of their homes in a rowboat. As a community leader my dad, Rev. Marcus, assisted residents in acquiring relief checks from the Red Cross. My parents were among those who lost everything in the flood. What if Dad took his family's relief check and distributed it among needy neighbors? Liberals would praise Dad for his compassion for the poor. The reality is Dad's behavior, though well-intended, would be irresponsible to my mom and younger siblings living at home. Such common sense adult thinking seems to escape liberals. Kasich's answer regarding gay marriage was the second issue that won him great praise from liberals. Kasich said while he is a traditional guy, the courts made gay marriage law and he will comply. Kasich added that he attended a friend's gay wedding because we must love people. I am sorry Gov Kasich and Leftists, but it is absurd to suggest that loving someone means embracing everything they do. Once again, more brain-dead emotion-driven liberal reasoning. Sometimes, love means rejecting a friend or family member's behavior. Here is an interesting observation. Like many youths, a handful of Dad's adult grand-kids have gone through a rebellious stage; straying from their Christian upbringing like the prodigal son. Each of them hid their sinful behaviors from my dad. They hold Dad's opinion in high regard with a desire to make him proud. Even my daughter seems to care more about my dad's opinion of her than mine. I asked myself, why? Dad is not a tyrant in any way. He is loving and easygoing. So why do the millennials in our family care so much about their granddad's opinion of them. The answer is all of their lives, they have witnessed the consistency in Dad's Christian walk and his commitment to biblical standards. The grand-kids know Dad loves each of them dearly, but is faithful to his commitment to Christ. My daughter and the other grand-kids love Dad greatly and give him their utmost respect. Perhaps, millennials are looking for trustworthy leaders/politicians who stand for something. GOP presidential contender Sen Ted Cruz comes to mind. Too many wimpy baby-boomers embrace every Leftist anti-Christian and anti-American socialist/progressive agenda item; desiring to be thought of as modern and enlightened. 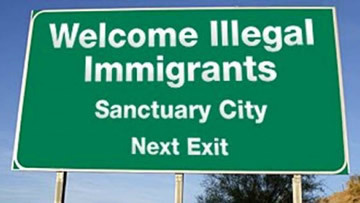 Talk about crazy brain-dead thinking – even with epidemic high numbers of murders, rapes and assaults on Americans by repeat criminal illegals, nothing seems to soften sanctuary cities' commitment to welcome and protect illegals. Wacko liberals in charge are dangerous, folks. Liberals wrongfully get high marks for compassion. The truth is real compassionate leadership makes wise responsible decisions. Liberals define a compassionate nation as how long that line is of people showing up for their daily allotment of free fish. In America today, 94 million Americans are unemployed. And yet, they have all the necessities and many of the luxuries of working Americans. Forty-seven million Americans are on food stamps. Millions of capable Americans are receiving disability. Conservatives define compassion as liberating citizens from government. Government handouts are always accompanied with government dictates and controls. There “ain't” no free lunch. Liberals wrongfully get high marks for compassion. The truth is real compassionate leadership makes wise responsible decisions. Liberals define a compassionate nation as how long that line is of people showing up for their daily allotment of free fish.